* Share price as of close on November 7, 2014. This Bridge Report provides details of Nihon Enterprise Co., Ltd. and information pertaining to earnings results for the first quarter of fiscal year May 2015. Nihon Enterprise is a "mobile solutions company," with two main business segments. One is the contents services business segment, where various contents including lifestyle and traffic information services are created and distributed to smartphones and other mobile devices. The other is the solutions business segment, where contents creation and operations, systemintegration, advertising business (in-store affiliate), reverse auctions, IP phones and other solutions (Cost reduction) are provided. Furthermore, Nihon Enterprise is also promoting efforts to expand its business into overseas markets including contents provision in China and India. Nihon Enterprise maintains a unique strategy focused upon the development and ownership of its own contents created in-house as a means of differentiating itself from its competition and achieving high profitability. This strategy has also enabled the Company to expand sales of its performance-based compensation (Success fees) contents through cooperation with cellular telephone retailers to conduct affiliate program contents sales (Real affiliates developed independently). The Nihon Enterprise Group is comprised of eight consolidated subsidiaries including the company Dive Co., Ltd., which provides advertising businss, At The LOUNGE Co., Ltd. which provides music related services, Advanced Traffic Information Services, Corporation (ATIS Corp.), which provides traffic and other information services, 4QUALIA Co., Ltd., which provides web and mobile site development and maintenance services and contents development, HigLab Co., Ltd., which conducts native application development as part of the mobile contents business, Enterpise (Beijing) Information Technology Co., Ltd., which operates cellular telephone retail shops in addition to business management in China in China, Beijing YZH Wireless Net Technology Co., Ltd., which provides mobile contents planning, development and distribution, and Ruisi Tech Solutions Co., Ltd., which provides IT related educational services. The Group also boasts of another four non-consolidated subsidiaries including and One, Inc., which provides voice communications related solution services, Aizu Laboratory, Inc., which provides smartphone application planning and development, Ruisi Broadcasting (Beijing) Digital Information Technology Co., Ltd., which provides mobile contents distribution and character licensing services, and NE Mobile Services (India) Private Limited, a local company operating in India. Designed to promote both the emotional and physical health of female users. Predicts menstrual and ovarian cycles, provides effective advice on dieting by using users' thin period, diagnosis for stress, and various menus specifically for female users (d-Menu, au Portal, SoftBank, Sugo Toku Contents, au Smart Pass, Yahoo! Premium, Feature Phone). With regards to the contents services business, Nihon Enterprise will fortify its earnings structure through the provision of monthly and fixed rate fee subscriptions for smartphones users of carriers' official websites. At the same time, it will operate content platforms that connect "native applications" developed for games, tools, healthcare (lifestyle), and user communities. Within the solutions business, efforts are being implemented to ensure that growth is seen in the four key realms of consigned development (for Smart devices), advertising business (In-store Affiliate), cost reducing solutions (IP telephones, reverse auctions), and collaborative models (Alliance type). Sales to smartphones rose to account for 66% of the contents services business's sales during the first quarter (June to August). Smartphone services provided on monthly and subscription fee basis, and fixed rate fee services of carrier websites steadily expanded and fortification of the earnings structure progressed smoothly. Nihon Enterprise is endeavoring to expand services via telecom careers through the promotion of usage and additional introductions on a fixed rate service. At the same time, the Company will cultivate "content platforms" for smartphones as part of its proper business. Nihon Enterprise seeks to create "content platforms" that are originated from Japan and globally competitive, in addition to producing hit native game applications for smartphones. In the near term, the chat application "Fivetalk" (Over 1 million downloads) and the women's health support application "Women's Diary" (Over 2.5 million downloads) experienced steady growth in download counts. 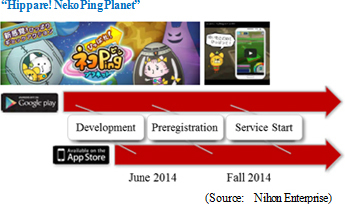 Furthermore, preregistration (Android™ version) for "Neko Ping! Planet" native game application started on August 22, 2014 by HighLab Co., Ltd., which was established as a consolidated subsidiary in April 2014 for the purpose of full-scale entry into the smartphone game application market. "Neko Ping! Planet" native game application is an action game where a space cat called "Co-Ne" rides a small spacecraft to go save a childhood friend. The game boasts of a hero with a laid-back, lighthearted, and lovable character and can be played with one finger to provide with exhilarating experiences, regardless of age or gender. During the first quarter (June to August), advertising (In-Storet affiliate) sales rose to ¥404 million from ¥207 million in the same period of the previous term, and exceeded the ¥225 million recorded in the previous quarter by a large margin. In addition to efforts to strengthen relationships with collaborating cellular telephone retailers and increase the number of stores, efforts were successful in cultivating new cellular telephone retailers. In addition, the receipt of consigned work for declining birthrate countermeasures from Chiba Prefecture, and sales of the free internal IP phone application "AplosOne Softphone" using smartphones were started as part of Nihon Enterprise's efforts to cultivate new businesses providing opportunities to secure earnings. Development of a messenger application for corporations that boasts of strict security control measures is being promoted with a target sales launch during this fall. Nihon Enterprise also expects to provide customization of this messenger application for individual clients. Chiba Prefecture has consigned a portion of its declining birthrate countermeasures for validation to Nihon Enterprise and work started on September 5, 2014. 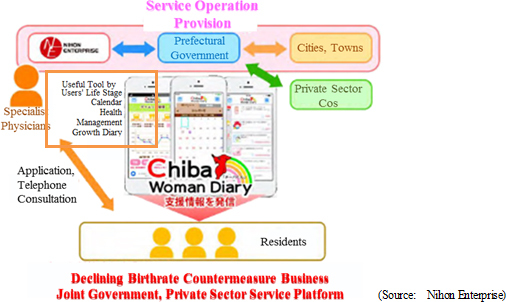 This project is based on the operation of a smartphone application "ChibaWomanDiary" developed by Nihon Enterprise to provide various support services for women at various stages of life including marriage, pregnancy, childbirth to child education in a service platform. Chiba Prefecture seeks to validate the effectiveness of its various support services through the provision of "support information", "specialist physician consultation service for healthcare and childcare", "calender and convenient healthcare management tool" and other services provided in the "ChibaWomanDiary" application by collecting female monitors who are experiencing various stages of life including marriage, pregnancy, childbirth and child upbringing. The popularity of "Women's DIARY" health support application with more than 2.5 million downloads, "Women Beauty Rhythm" and other applications for use by women developed by Nihon Enterprise, as reflected, is a reason for their selection by Chiba Prefecture. The Company expects to establish know-how through this joint project that will enable it to expand the provision of these applications and services to other regional government bodies. As part of the cost reduction solutions provided, sales of the free internal IP phone application "AplosOne Softphone" for smartphones was started on August 18, 2014. "AplosOne Softphone" is available as an option of the IP-PBX solution "AplosOne", and it uses the VoIP engine "Primus SDK" developed by the consolidated subsidiary and One Inc. This solution will provide some 510,000 small to medium sized corporations and 3.34 million small private business owners with a cost reducing service using the high quality Softphone service. Advantages of Introducing "AplosOne Softphone"
① Smartphones can be used to make internal phone calls, eliminating the need to have fixed line business phones at each desk (This system allows smartphones to replicate the basic functions of fixed line business phones and transfers phone calls made to fixed line phone numbers to the employees smartphone, completely replicating the operating environment for business telephones.). ② Free phone calls can be made between smartphones using the internal telephone system and employees at the headquarters or other company facilities. ③ The system has a "WEB Client Telephone Number List" function that allows administrators as a single point to manage and distribute extension numbers and client numbers to each smartphone. ④ As you can make an external call from a fixed line telephone number (Using regional area codes like 03 for Tokyo and 06 for Osaka), you need not worry about separate calculation for the cost of private calls and business calls. Nihon Enterprise operates cellular telephone sales retail shops (Two China Telecom stores) in the Shanghai region of China. While changes in carrier sales strategies during fiscal year May 2014 led to a decline in earnings, efforts to facilitate an earnings structure that will not be influenced by the sales strategies of carriers are currently being implemented. Specifically, external sales directly to large corporations, fortification of accessory product sales, and cost reductions through optimized allocation of human resources are being conducted to achieve profitability at an early stage. Sales rose by 15.6% year-on-year to ¥1.316 billion during the first quarter. The contents services business sales rose by 11.7% year-on-year to ¥647 million on the back of increases in carrier fixed rate services, including traffic information, lifestyle and games. At the same time, solutions business sales rose by 19.6% year-on-year to ¥669 million due to strong advertisement (In-Store affiliate). In addition to expansion in the contents provision (Provision to "Commukara" of au Smart Pass started), growth in contents provided to carrier fixed rate services including SoftBank Mobile's new "App Pass" and Indonesia's major communications carrier XL Axiata's "AppSeru" services was recorded within the contents services business. The free chat application "Fivetalk" exceeded 1.0 million downloads and preregistration for the "Neko Ping! Planet" native game application was started. At the same time, In-store affiliate sales nearly doubled within the solutions business. Strengthening of collaboration with cellular telephone retailers and an expansion in the number of stores that act as dealers combined with successful efforts to cultivate new cellular telephone retailers and increases in the number of customers at stores due to carrier sales promotions to act as a tailwind for Nihon Enterprise. In addition, the consigned work for declining birthrate countermeasures "ChinbaWoman" was received from Chiba Prefecture, and sales of the free internal IP phone application "AplosOne Softphone" using smartphones was started. With regards to profits, the higher sales and cost reductions of cellular telephone sales allowed cost of sales margins to improve and gross income to rise by 20.6% year-on-year. However, aggressive advertising for the contents services business (Up from ¥113 to ¥212 million) caused sales, general and administrative expenses to rise, and operating income to decline by 12.4% year-on-year to ¥52 million. At the same time, non-operating income improved on the receipt of subsidy income. Furthermore, profits on sales of marketable securities increased and boosted extraordinary income from ¥107 to ¥331 million and allowed net income to rise by 159.1% year-on-year to ¥212 million. Nihon Enterprise began providing Woman's DIARY, A Walk in the Clouds and A Space Odyssey applications to XL Axiata, Indonesia's second largest mobile communications carrier (Boasting of 70.00 million contracts). "AppSeru" is an application service provided within the "Gudang Aplikasi" application store operated by XL Axiata, and user can download as many as applications he/she likes in the service., It currently distributes about 100 applications including games. The provision of "Chokotto Game" (casual games) to SoftBank Mobile's "App Pass" service has been started. "App Pass" is an application service of SoftBank Mobile, which was launched on August 29,2014. User can download as many as applications he/she likes in the service. With "App Pass," you can use popular applications at a fixed rate of ¥370 (excluding tax), instead of a normal price of ¥40,000 or more in total. "Chokotto Game" (casual games) is a portal site that distributes classic mini-games that can be played while riding trains, taking breaks or other short periods of time. Provision of ten popular games including the classic games "Solitaire" and "Reversi" and other games like "Brain Training Game" have been started, with other games expected to be introduced gradually (Common access site for both PCs and smartphones: http://ent.mb.softbank.jp/apl/appsu_w/index.jsp). At the end of the first quarter, total assets declined by ¥72 million from the end of the previous fiscal year to ¥5.469 billion. Along with the increase in sales, accounts receivables also grew, but the sale of marketable securities contributed to a decline in investments. Unpaid tax assets and net assets declined due to the payment of taxes and dividends. At the end of the first quarter, equity ratio stood at 76.7%. Nihon Enterprise's estimates call for sales to rise by 13.8% year-on-year to ¥5.130 billion (An ¥80 million downward revision from initial estimates of ¥5.210 billion). This revision was caused by delays in the development of the new service "AplosOne Soft Phone". However, carrier fixed rate services and advertising are trending favorably from the start of the second quarter, and strong demand for consigned development related to smartphone applications is expected to allow full-year sales to grow. With regards to profits, operating expenses are expected to rise on the back of increases in development expenses for native game and tool applications and fortification of sales promotions (Advertising expense is expected to rise from ¥515 to ¥600 million). And while the higher sales and improvements in profitability of the cellular telephone sales operations in China had been expected to absorb the higher expenses and allow operating income to rise by 23.7% year-on-year to ¥415 million, aggressive sales promotion for native applications (Advertising expense from ¥600 to ¥724 million) is the main factor behind the decision to revise earnings estimates downward (Operating income revised down from ¥415 to ¥220 million, ordinary income from ¥430 to ¥230 million, and net income from ¥350 to ¥150 million). Dividend payment remains unchanged at ¥3 per share, and is expected to be paid at the end of the term. It reflects a ¥1 increase to offset the disappearance of the commemorative ¥1 dividend paid in the previous term. Nihon Enterprise recorded mixed earnings results during the first quarter (June - August) with higher sales and lower profits. And while the Company revised down its earnings estimates, the main reason for the revision of higher advertising and other sales, general and administrative expenses are viewed as anticipatory investments to bolster future earnings and they are expected to be recovered in coming terms. In addition to development of applications for smartphones, Nihon Enterprise fortified its services provided to official carrier services, capturing the shift from feature phones to smartphones, and the Company expanded its earnings. Consequently, the Company is in a temporary lull, expecting further growth in the coming term. The Company's strategies include the strengthening of existing businesses, as well as the expansion of non-carrier related businesses by the fortification of native applications within the contents service business. The other important strategies for future growth are Nihon Enterprise's efforts to expand collaborative business (Alliances based upon the Company's services and contents) and to develop cost reduction solutions (IP phones, reverse auctions) within the solutions business. With regards to the contents services business, provision of applications through fixed rate fee and monthly subscription services of official carrier websites to smartphones is steadily expanding and contributing to fortification of earnings structure of the Company. In the solutions business, recovery in advertising is complemented by the start of sales of free communications applications that turn smartphones into internal IP phone systems and the receipt of consigned work for declining birthrate countermeasure support from Chiba Prefecture as new contributors to earnings. Furthermore, provision of messenger applications with the highest degree of security control started in November. These efforts currently being undertaken by Nihon Enterprise are expected to contribute to future growth in its business and earnings. Copyright(C) 2015, All Rights Reserved by Investment Bridge Co., Ltd.